You don’t have to spend hours trying to sanitise your oven when you can have it cleaned faster and with better results. 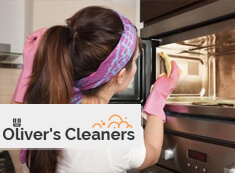 Oliver’s Cleaners offers reliable and inexpensive oven cleaning services which will make your cooking appliance polished thoroughly inside and out. Our team of cleaners will remove the grease, stains and food residue manually from your oven. They will soak its removable components in biodegradable cleaning solution. Get in touch with our company to schedule the oven cleaning which you need in Hampstead NW3 and we will provide it. Our oven cleaning services are suitable to be used by home owners as well as by proprietors of restaurants and other commercial estates. They will improve the condition of your cooking appliance and remove the smell from the meals which you have cooked. Our cleaning personnel will dismantle the oven racks, grid and other removable components to soak them in non-toxic cleaning solution. In the same time, they will scrub and polish the oven surfaces manually inside and out. Our staff will apply mild detergent to remove the grease and stains inside the oven. They will polish the hobs and the whole external body of the oven. After the oven parts soak well, our cleaners will rinse and wipe them and reassemble the components. The cooker cleaning which we provide in NW3 Hampstead is very effective and qualitative. It is at your disposal as one off and regular service. Get in touch with our company, located in Hampstead NW3 to book the oven cleaning which you need. It will make your cooking appliance perfectly clean without spending hours scrubbing and wiping it. Our services are low-cost and implemented by qualified cleaners.